The Italian Village Restaurants provide you a unique dining experience for any occasion. We’ve been hosting birthday parties, anniversaries, prom dinners and assorted special events for our customers for more than 80 years. Choose from the charming atmosphere of the rustic, “star lit” Italian street in The Village; the intimacy of a cozy wine cellar in La Cantina; or the contemporary Baroque elegance of Vivere. For more information, please contact our Event Director at (312) 332-7005 or email ivcatering1927@gmail.com. The Village can seat up to 36 guests in the center of the dining room set in a nineteenth century village. Private dining is available for up to 15 guests in a private room or booth. Parties can be accommodated in The Village seven days a week from lunch through dinner hours, or after theater parties or pre- or post-game gatherings. In Vivere, cocktail gatherings and sit-down dinners for up to 50 guests are available in The Balcony, overlooking the main dining room. Parties of 60 can reserve the main floor dining room for dinner or buffet service. The entire room can accommodate seating for 125 or a buffet gathering of 170 with cocktail service in the intimate Lounge. Lunch is served Monday through Friday; dinner Monday through Saturday. Private parties also can be booked on Sundays. 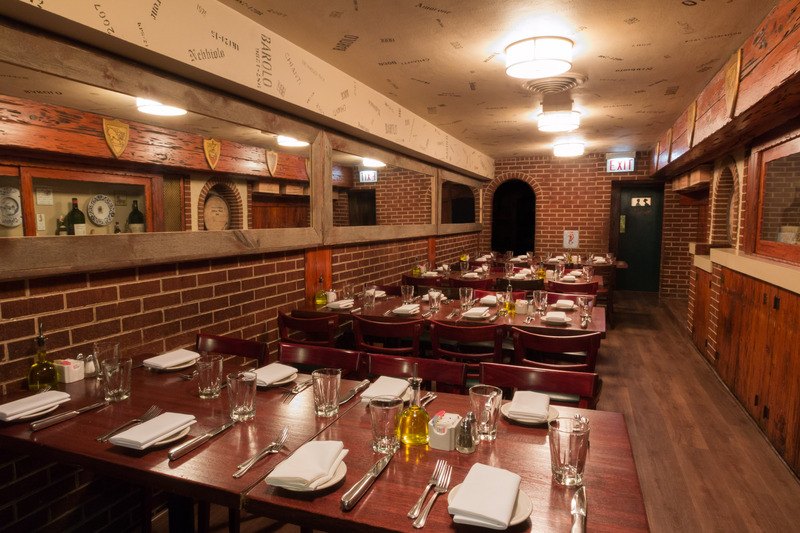 La Cantina is a pleasant dining room reminiscent of a snug wine cellar. The restaurant can seat up to 120 guests. Enoteca (the Library), with its walls of books about food and wine, and Vista, provide semi-private areas for up to 25 to 35 guests. La Cantina is open Tuesday through Saturday for dinner. Private Parties can also be booked on Sunday and Monday.